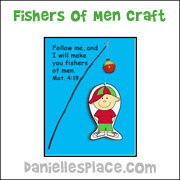 The following craft comes from the Sunday School Lesson "Seeds of Faith" on The Resource Room. 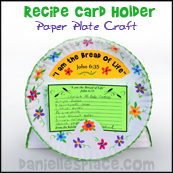 This craft can be used as a review game or a tool to help your children stay in God's word. 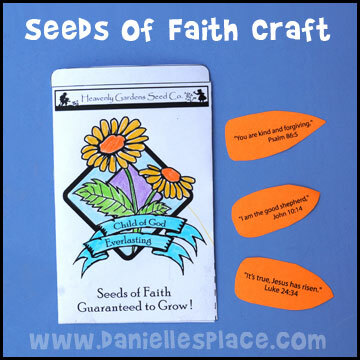 Children color a seed packet in class and place the seed shapes with either words from the Bible verse written on them or Bible verses that will help them grow in their faith. "These "seeds of faith" will help you grow, through God's power, a lovely child of God who will produce abundant fruit of God's glory. When to plant: Effective in all zones. Plant anytime of the year. How to Plant: Start seeds indoors or outdoors anytime of the day or year. The earlier the better! 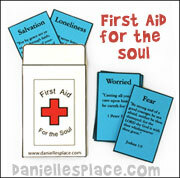 Plant new seeds daily to insure a continuous crop of the Fruit of the Spirit. 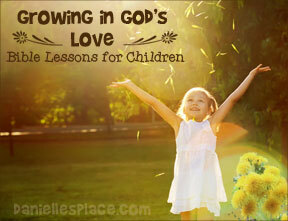 Fertilize with lots of love and understanding. 1. Before class cut large heart shapes from construction paper. Cut two slits using an Exacto knife in the heart so that the stem can be inserted into the heart as shown in the picture. 2. 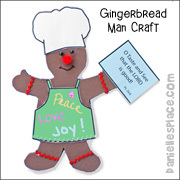 Cut out a stem from green card stock, 9" x 3/4" wide for each child. 3. In class show the children how to insert the stems in the cards so that the flower can be moved up and down to look like it is growing. 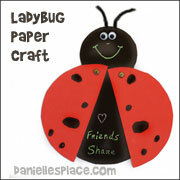 Provide construction paper, glue, and tape so they can design their own flowers. 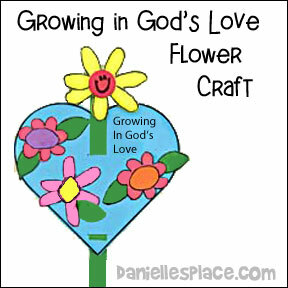 If you have young children precut some flower shapes for the children who have a hard time cutting. *My second graders did this craft. I thought they might think it was too babyish, but they all seemed to enjoy it. Also, to save paper I used my bag of left over paper scraps from previous craft projects. 2. Prepare the seed display before class according to the directions. 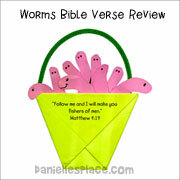 3. Review the Bible verse with your students. Place all the seeds in their correct positions in your display and go over the verse several times. 4. Take all the seeds out of the display and put them in a bowl with the extra seeds face down. 5. 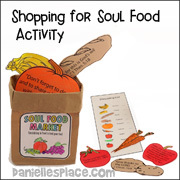 Have the children take turns picking a seed and placing it in the appropriate place on the display if it has a word written on it. If the seed doesn't have a word, the child does nothing on his turn. 6. 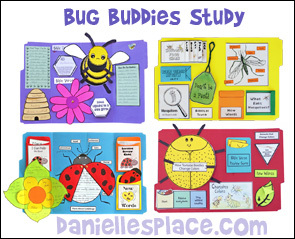 When a child has picked a place where he thinks the seed should go, have him lift up the flower flap to see if the word on the seed matches the word written underneath the flower. If it does, leave it there and tape up the flap so that the flower and word are displayed. 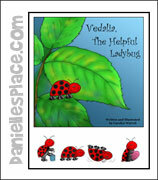 If it doesn't match, have the child try another place to place the seed. When he gets it right, have him say the Bible verse. 7. Keep going until all the children have had a turn and all the words are in their correct place. 1. 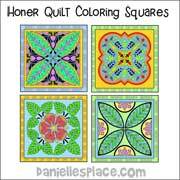 Place five sheets for different colors of paper together, one on top the other, and place the heart link pattern on top. 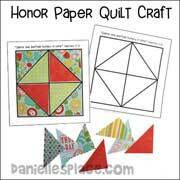 Staple the pattern on top of the sheets of paper placing the staples on four sides of the paper and in the center. This will keep the patterns from moving when you cut. 2. Cut out the shapes and then cut the Y-shaped lines in the center of the links by folding the handle of the hearts in half and cutting from the fold down to the heart. Unfold, and then cut the two top lines to make the Y shape. Cut through the paper, unfold, and finish cutting the line. 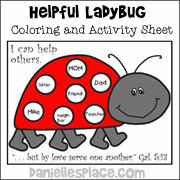 Make sixteen heart links for each child. 3. In class have your children write one word of the verse on each of their links and then create a chain of hearts that spells out the verse. Slide one of the links behind and through the slit on the new link, turn it, and pull it up against the top of the link. 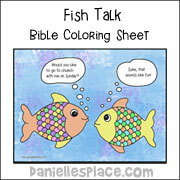 Children fill in the blanks by answering the questions at the bottom of the sheet to reveal the Bible verse. Logan wants to grow sunflowers that reach all the way to heaven by the end of the summer. With the help of his wise father, Logan learns how important it is to not only plant seeds in the ground, but to plant them in them in the hearts of his friends. Read "The Sunflower Parable: Special 10th Anniversary Edition (Parable Series) " by Liz Curtis Higgse hearts of his friends and neighbors. 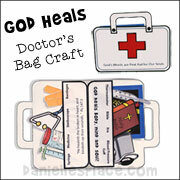 Go to the God Heals Us Bible Crafts and Activities Page for these crafts. 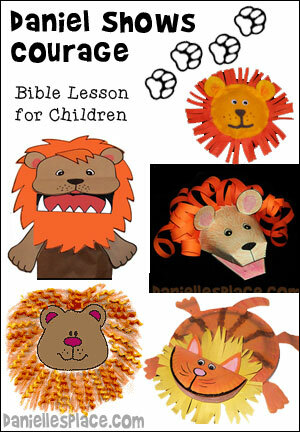 This lesson is also available as a Free sample Bible lesson. 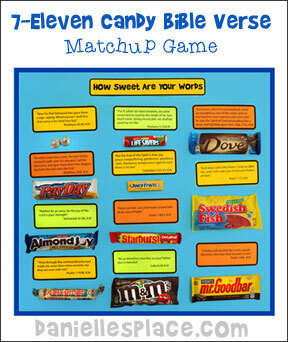 Children matchup Bible verse cards to popular candy that can be found at 7-Eleven for about $8.00. 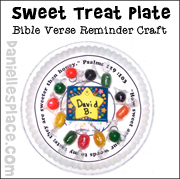 After your children have matched up all the candy to the verses, you can make a "How Sweet are Your Words" poster with the candy wrappers. 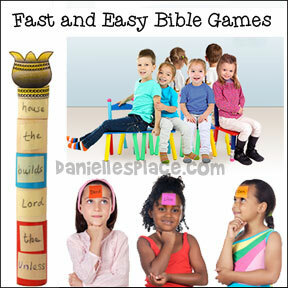 For more information see the Printable Bible Verse Games Page. 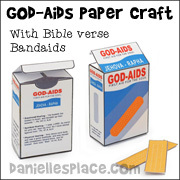 Printable Bible verses in both KJV and NIV are available to members. 1. 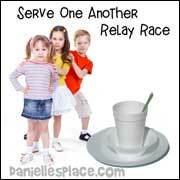 Add one or two tablespoons of water to a package of powdered Kool-aid. 2. Draw pictures of fruit on a piece of paper and write at the top “God gives us good food”. 3. Have the children paint with the appropriate Kool-aid mixture to make fruits that actually smell like the picture they are painting. 4. 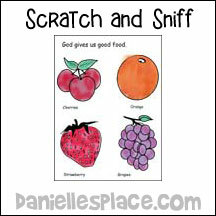 When the pictures are dry, show them how to scratch them with their fingernails to smell the fruit. 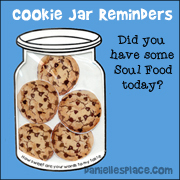 Bring in Food Pictures, some healthy and some not so healthy (recipe cards work well for this). Hold up two pictures at a time, one healthy and one not so healthy. Ask the children which would be a better choice to eat for dinner. 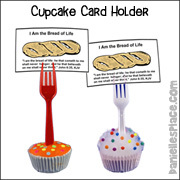 Explain that we don’t want to eat too many desserts because they are not very healthy and that we should eat them after we have eaten healthier foods. over medium-high heat until the mixture forms a ball. Place the ball on waxed paper to cool. Store in an airtight container. Cut the fruit picture from the gelatin box and paste to the lid. 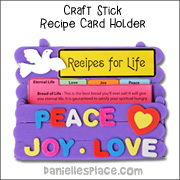 Use different flavors to make all different colors and smells. 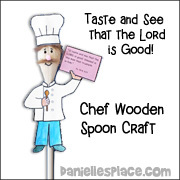 These crafts comes goes with the Bible lesson "Taste and See that the Lord is Good" on The Resource Room. 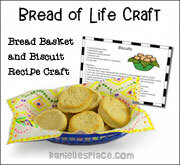 See "Bread of Life" Crafts Page. 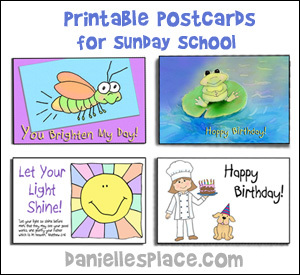 Free Sunday School Lesson for Children - For a complete lesson, activities and crafts go to the Resource Room Sample Lesson Page for "Ladybug Friends".